Frye Gaillard has given us a deeply personal history, bringing his keen storyteller's eye to this pivotal time in American life. He explores the competing story arcs of tragedy and hope through the political and social movements of the times -- civil rights, black power, women's liberation, the War in Vietnam, and the protests against it. But he also examines the cultural manifestations of change -- music, literature, art, religion, and science -- and so we meet not only the Brothers Kennedy, Martin Luther King Jr and Malcolm X, but also Gloria Steinem, Janis Joplin, Jimi Hendrix, Johnny Cash, Harper Lee, Mister Rogers, Rachel Carson, James Baldwin, Andy Warhol, Billy Graham, Thomas Merton, George Wallace, Richard Nixon, Angela Davis, Barry Goldwater, the Beatles, Bob Dylan, and the Berrigan Brothers. "There are many different ways to remember the sixties," Gaillard writes, "and this is mine. There was in these years the sense of a steady unfolding of time, as if history were on a forced march, and the changes spread to every corner of our lives. As future generations debate the meaning of the decade, I hope to offer a sense of how it felt to have lived it. 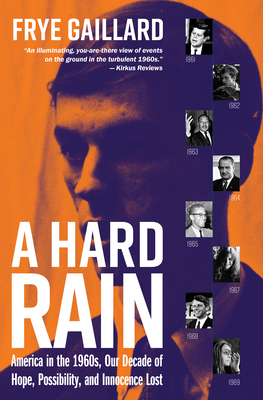 A Hard Rain is one writer's reconstruction and remembrance of a transcendent era -- one that, for better or worse, lives with us still.